How do we mix paint and wine ? 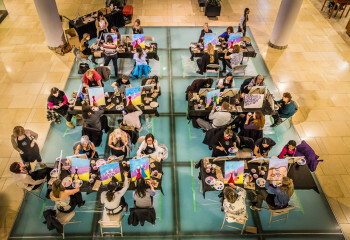 Food, wine and art are three of life’s greatest pleasures and we’re just thrilled to offer paint and wine sessions for public and private entertainment. Our priority is ensuring your comfort, relaxation and entertainment, so we’ve listed some of our Frequently asked questions below. Be sure to check out our How It Works page so you know exactly what to expect when you get here. What if I don’t have any painting or artistic ability? That makes it all the more fun. The process is based on having no painting experience at all but is also very enjoyable for those who do. We are about creating “fun” art not fine art. We use acrylic paint that is water based and non-toxic and the easiest painting medium for beginners. It also dries fast which allows you to take your painting home with you the same night. Sessions are typically two hours long. Participants are encouraged to come early to check in, grab their apron, get a drink and meet some new people before the session starts. Can I bring my painting home the same night? Absolutely! Your masterpiece will be completed and the paint will be dry in the two-hour timeframe. That’s an easy one – bring a friend or two, a smile and a can-do attitude. All painting materials and a glass of wine (or beverage of your choice) are included. What is the price of a session and what is included in that price? The cost is $55 plus gst and includes all painting supplies including canvas, easel, paint, brushes and apron as well as instruction and one drink – all for one price. Saturday mornings $45 plus gst and includes coffee and tea. Can I purchase food and drink? You bet. We have a fabulous food menu and a great selection of wine and beer. We recommend arriving extra early if you want to enjoy a bite to eat before the painting starts. I don’t drink alcohol. What other options are there? We have a tasty assortment of juices, sparkling water, tea and coffee and non-alcoholic beer and cider. Will there be gluten-free options on the menu? We are committed to a great experience for all of our customers so our menu includes gluten free choices as well as meat free options. Do I have to clean up after the session? Your only job is to Paint. Sip. Repeat. and have fun. No clean up required. We have staff to do that for you. How do I know what to paint? Each night there is a featured painting. Everyone paints the same painting. Check out our calendar and sign up for the painting you want to paint. 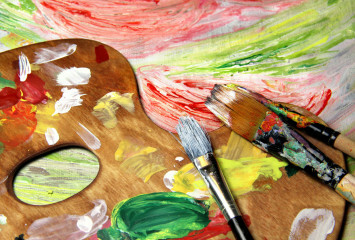 Our artistic director will guide you verbally and visually to complete your painting. Is two hours enough time to finish my painting? All of our paintings were created with you in mind. Two hours will allow you to finish your painting (with breaks) and have fun along the way. Why is it called a session and not a class? Our business is to entertain. The session is a social event not a class. Our artistic director leads you through the process of getting the paint on the canvas so you can complete your image in one sitting. You may learn something along the way but it is not required. We do not. We are in the entertainment business and at this time, classes do not fit the bill. We may, however, offer them in the future but only if it seems to be a good fit for our customers and our culture. Is there a discount if I come more than once? Yes there is a deal to be had for coming often. We have created a Membership Program and a Loyalty Program so that you benefit for being a frequent buyer. Details are at Stop and Shop. We do. Whether you are planning a bridal shower, birthday party, team building event or a client appreciation; we can assist you in hosting the best private event ever for your family, friends and colleagues. How many people do I need in order to book a group? A group can be anything from 10 – 42 people. The question then becomes is whether you want it be a private event. Private events require a minimum of $350 day and $1000 weeknights to $1500 Friday & Saturday nights. The studio can accommodate up to 42 painters. Yes! We do a seating arrangement for each session according to requests at the time of booking. If you are coming with a friend or two or three, let us know so we ensure you are together. Is the studio/café available for private events? Absolutely! We love private events (with or without painting as part of the event). What is the cost for a special or private event? That’s a tough question to answer without talking to you first. The cost will depend on the number of people attending, how much food and drink is being ordered, if you are painting or not and any other details important to your event. Call or email us, we’ll be happy to discuss. We do and you can purchase in any dollar amount. Gift certificates can be picked up, mailed, or e-mailed to you. How many people can you accommodate for a private party? If the private party includes painting, we can handle 42 people. If it does not include painting, we can handle up to 86 people. Do you support the non-profit sector? If so, how? Do we and how?! We are committed to both our local and global communities. Check out our Giving and Fundraising pages for more information. Are children allowed in the studio/cafe? Yes!, we are happy to have young painters join us on Saturday mornings or on one of our all ages nights. We do special events such as Mother’s Day, Father’s Day, Family Day and so on that are family friendly. We also offer birthday parties for kids. Is this just for groups or can I come alone or with a friend? Groups are secondary to our individual customers. Our main business is built on our sessions that are set up for a single person and or a few friends. We offer a friendly, inviting space so you can come with a friend or by yourself and meet new friends. Most of our customers will definitely be female but men are not only welcome but we plan sessions to encourage them to come. We have date night, singles night and sports themes that attract them. We know that some men like to combine paint and wine too! Why did you start Vin Gogh? We envisioned a ‘clubhouse’ that would be built on heart and serve to uplift individuals and the community as a whole. The minute we saw the ‘paint and sip’ idea, we knew we had found the business that would provide our clubhouse; a space offering a fun spin on self care; a place for creativity, connection and joy and it could be profitable. It was perfect!